We recommend using these discussion questions and activity with Ellen Berrey’s interesting and well-written article Sociology Finds Discrimination in the Law (read the full article for free here!) which appeared in the Spring 2009 issue of Contexts. 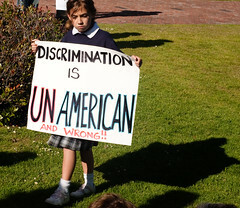 1) How would you define discrimination? How does your definition compare with a more formal, legal definition? 2) The article states that sometimes people discriminate unintentionally. What are examples of unintentional discrimination? 3) Based on what you learned from this article, what do you think should be done to rectify the effects of discrimination? Who should be responsible for taking action? Explore the Equal Employment Opportunity Commission website (eeoc.gov) and read up about the different kinds of discrimination. Have you or someone you know been a victim of the types of discrimination described? is available for free to ASA members. 1) On what grounds do the authors argue that Social Security and Medicare are not the biggest problems presented by an aging America? Activity: The article states that policies to help the elderly often need to target young people in order to come to a long-term solution. Think of a problem faced by the elderly and what policies directed at children now might help alleviate that problem in the future. 1) What are some of the stereotypes about older people that lead to employment discrimination against them? Are there stereotypes about young people that could spur ageist discrimination? What can be done to dispel myths and reduce discrimination in either case? 2) How is discrimination related to economics, and how might the current economic recession affect ageism in the workplace? Here’s a discussion-provoking activity to be used with “Why Are There So Many ‘Minorities?” by Mitch Berbreier from the Winter 2004 issue of Contexts. PDF here. The following is a list of social groups that have advocated or could potentially advocate to be considered “minorities,” awarding them protection from discrimination under the law in the United States. Put a checkmark by the groups that you think should be legally protected from discrimination. Briefly explain your decisions.